News / Opinion / Does the Suburban Rail Loop Signal a More 'Urban Melbourne'? Last week's announcement of the $50 billion, 90-kilometre long Suburban Rail Loop by the Victorian State Government, has generated a flurry of opinion and counter-opinion. As a Sydneysider, I thought I’d offer my view from outside your Melbourne bubble. A key question is: What does the Suburban Rail Loop signal about the future of Melbourne, assuming it is built over the next 30 years? Despite the obvious pre-election timing, this is an uncannily forward-looking plan with a range of city-shaping implications. Firstly, there is a strong connection to existing planning strategy in that it reinforces current efforts to focus housing, jobs and additional quality of life opportunities around prominent middle-ring centres. The idea is, of course, that this provides more ‘work and play’ options within range of more people all over the metro area. It also gives more shape to Melbourne’s relatively flat, low-density suburban sprawl. Youch. With or without the Suburban Rail Loop, you’re already on this path: the NEICs (National Employment and Innovation Centres) and fully stocked apartment supply around suburban centres attest to this. Basically, it looks like your Great Big City Centre - the hub of the Melbourne metro area - is getting meatier middle-ring satellites with a broader range of activities, jobs and housing - the spokes of this big hub. This is a fairly classic urban shape - a big centre orbited by suburban nodes which balance the centre’s mass, connected to it by a radial mass transit system. Here steps into this picture the Suburban Rail Loop, cutting an arc across these radial lines and stringing together these newly-boosted suburban centres. By connecting these ‘spokes’, the rail loop forms the rim of the wheel and so better distributes passenger loads across the rail system, reducing CBD transfers and enabling cross-town trips. With the Suburban Rail Loop, Melburnians can orbit their Great Big City Centre using mass transit, passing through a series of walkable and built up suburban nodes. 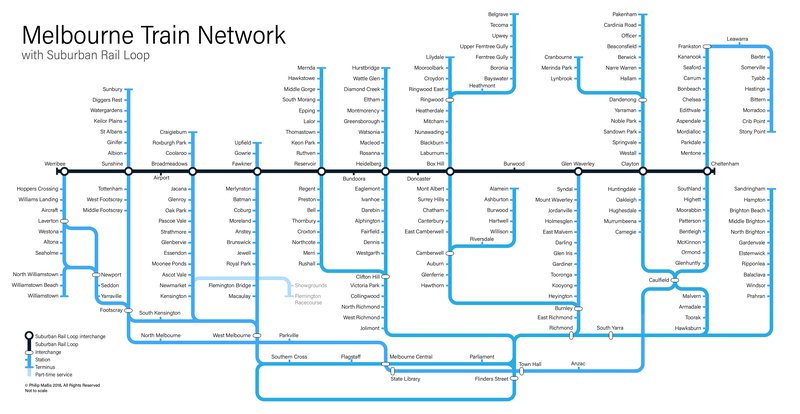 Metros rely on an interwoven network of lines to enable point to point journeys. In contrast, Melbourne’s rail system resembles a traditional commuter rail system; its lines are arranged radially around the Great Big City Centre, shuttling large loads of people in and out. Although Melbourne does have some large-ish suburban nodes on these radial lines, such as Box Hill, South Yarra, Caulfield, Dandenong and Footscray, it largely follows this pattern. If you live along a line that suburban centre is on, that’s fine, but for all other journeys, the only realistic option is to drive or be driven. On top of this, post-war car-oriented growth means many suburban centres aren’t even on a train line. Chadstone, Doncaster and Monash University in Clayton spring to mind. The Suburban Rail Loop then breaks with Melbourne’s traditional metropolitan form. Another thing about metros - they need a compatible urban environment. Metros are too expensive to string through low-density environments. Largely, they need to collect enough people on foot and deposit them at points across the network, again to destinations reachable on foot. Melbourne’s Great Big City Centre is well-suited to walking with many destinations and an amenable environment, but most of the rest of the metro area requires road-dependent collection and distribution. A built up, walkable urban environment is compatible with, and justifies the cost and capacity of, high-frequency rail service, but is incompatible with car-dependent transport. Well, roads have a low capacity. They fall over when they are asked to carry lots of people to the same place at the same time. They require a spread out urban environment to cater to dispersed trips. Think about the scale of ramps, carparks, and feeder roads required to serve your typical Westfield shopping centre, or the ramps and arterial roads to support a motorway. Contrast this to how many people cram into stairwells at Flinders St Station to access the platforms. Then, imagine if those people were all in cars with one or two people in them - you can barely fit a single car in one of these stairwells. People on foot, by contrast, are extremely space-efficient. Roads are flexible, excelling at carrying distributed point to point trips, but are highly space inefficient with a low inbuilt capacity. A car-dependent environment must necessarily be spread out or else it overwhelms the roads that support it. The urban environment is shaped by transport, and transport shapes the urban environment. Simples. The Suburban Rail Loop, therefore, applies pressure on the places it serves to be more focused, with a range of activities and housing within walking distance, to justify its cost and capacity. This signals a shift to a more 'Urban Melbourne' - at least a more urban ‘middle Melbourne’ complementing its Big Centre. Might this even put the brakes on your ever-spreading suburban footprint? Looking to the future, perhaps driverless cars at each end of a person’s cross-town transit journey will vastly extend the catchment of these nodes. By pre-emptively striking to secure a more Urban Melbourne, especially in the middle-ring, your city has more control and power over the resulting built environment once this direction matures. Rail performs best when it is positioned at the heart or direct edge of a centre, plugged into its walkable streets, while arterial roads should skirt around centres at a respectful distance with link roads striking into edge-of-centre parking (much like a suburban shopping mall). Sydney hasn’t managed this distinction very well. Strathfield in the middle ring of Sydney. Poorly managing densification results in poor outcomes like this. Source: Posted with Permission from an anonymous source. 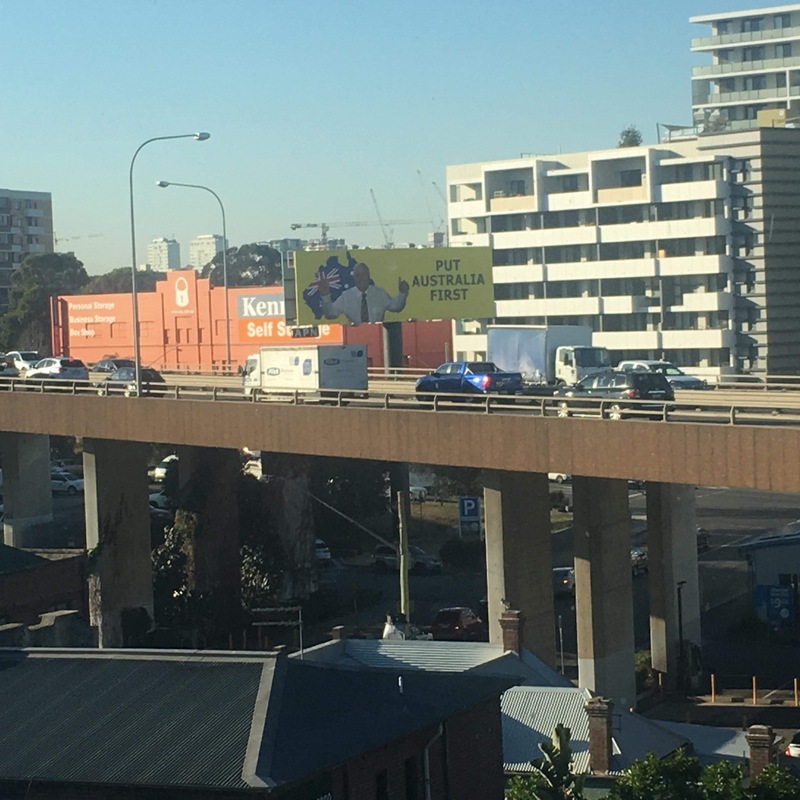 A large part of Sydney’s middle-ring looks like this - a haphazard mess of roads, density and traffic - especially outside the posh bits of the city. We started densifying around suburban centres decades ago, but the process has been unstructured, haphazard and often vision-less. Dense places must be walkable and have regularly-used services set into this environment. Otherwise, people will opt to drive, and with so many cars hitting the road, road network quickly become overwhelmed. Then, you have the undesirable situation where particulate matter from constant traffic enters the lungs of the people that live within its catchment. It’s not a good combo. This has happened in many parts of Sydney, especially outside the posh areas - reinforcing another Sydney specialty - spatial inequality - and it provides a cautionary tale of what not to do. Your city, on the other hand, has a positive vision that, coupled with good urban design, might hopefully avoid your northern neighbour’s pitfalls. Melbourne, with Metro 1 (and hopefully Metro 2) allowing very frequent radial train service, plus a frequent Suburban Rail Loop, will have the necessary infrastructure to support enriched clusters of activity and housing, knitted into a metropolitan transit grid. The Suburban Rail Loop is ambitious but full of potential. Well done to you Melbourne, you are now entering a higher orbit. Sydney, more particularly the NSW Government, announced and re-announced the North West railway, now Metro, so many times that it became a joke. Let's hope this isn't repeated down south.